I have been wanting to write this post since I started my blog last year, but I knew it would take a lot of research to get it right, and I also know a lot of people will disagree with me, but after discussing it with someone today, I was determined to post my view on this. People think living in Turkey is cheap… It’s not. Unless you’re living off a British pension or have an income from other sources in the UK, it’s not cheap to live here at all. When I say to people it’s hard to live off a Turkish wage and that we always end up getting into debt, people tell me ‘you just need to budget better and not have a holiday lifestyle, it’s so cheap to live in Turkey’… I know for a fact that it’s not, and people just do not realise how local people really struggle. Ok, now a little disclaimer, this is NOT about me. It’s not a pity party. I can get on the next flight home to England if it becomes too hard to live here. This is for the local people, the Turks, the thousands of people working in Turkey who do not have the luxury of choosing where to live or have many job opportunities. I have always said that living in Turkey is actually more expensive than living in the UK. When you compare like for like, Turkey appears cheaper, but when you consider local wages, you realise it’s not. If you’re an expat in Turkey and have more than £250 a month in income from a pension or other means, you are financially better off than a lot of locals in Fethiye, and all over the country. The minimum wage here is 895tl a month after tax – that equals £255 a month or roughly £3068 a year. (For arguments sake throughout this article I’m using an exchange rate of 3.5tl/£1 as this is the rate being given in town as of today). This is minimum wage across the country. Compare this to minimum wage in the UK which is £6.31 an hour – for 40 hours a week this would be £11,380 a year AFTER tax, or £950 a month, roughly. This means that the minimum wage in Turkey is 3.7 x less than the UK, therefore, for Turkey to have a cheaper cost of living than the UK, the prices of everything would have to be 3.7 x lower than in the UK… let’s look into that and see if that is the case. 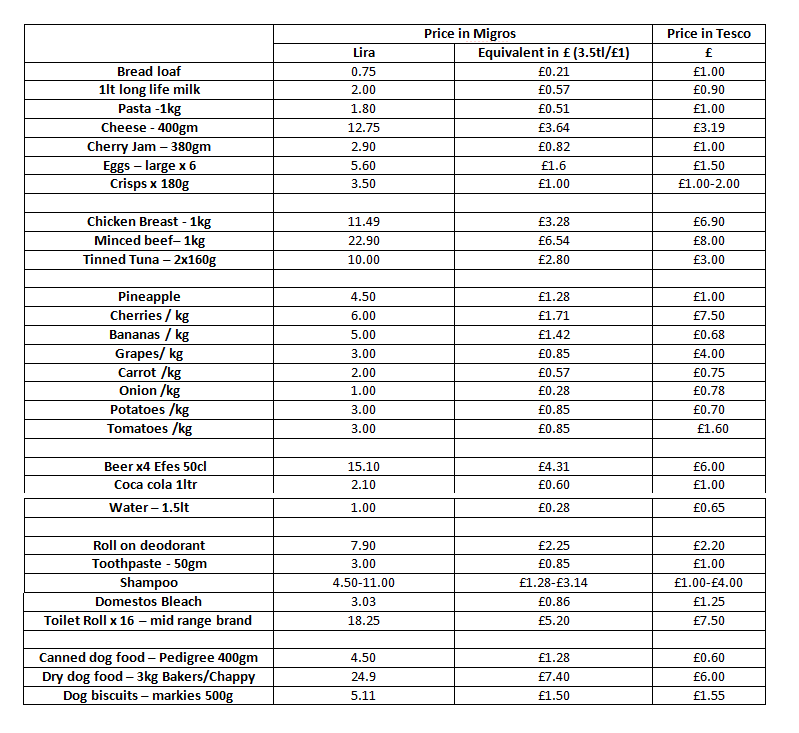 I have investigated the prices of many everyday items – I looked online at two main supermarkets – Migros for Turkey, and Tesco for the UK. These are pretty much the same thing, big supermarkets. Of course there are cheaper options for all of the foods listed, I could have looked at Aldi & Lidl compared to Turkey’s Bim & Sok for lesser known brands and cheaper choices, but for ease I’m looking at the two main supermarkets. The fruit and veg prices were compared using Tesco prices vs Fethiye market prices – the cheapest possible place to find them. The photo below shows my findings. As you can see, for most of the products, the price of these when converted into pounds is cheaper in Turkey, but not by very much, and certainly not 3.7 x cheaper. Things like bread, water and some fruits such as grapes and cherries are significantly cheaper here in Turkey, even with the difference in wages. For most things however, when considering the wage difference, are more expensive here in Turkey. For example, I did not find one single house product that was cheaper here, in comparison. Bleach, toothpaste, toilet paper, shampoo and deodorant are all more expensive, along with everyday food items such as pasta and milk. Meat prices here in Turkey are ridiculous – as you can see from the table all red and white meat is significantly more expensive here when you factor in the wage differences. Perhaps most shockingly, some of the everyday items are actually significantly more expensive in Turkey without even looking at the wage comparison – cheese, eggs, bananas, potatoes and pet food are all more expensive here in Turkey than it would be if we were shopping in Tesco. There’s also the fact that supermarkets in the UK often have “buy one get one free” deals which I rarely see in shops here. I see where other expats are coming from – their pounds go further here than at home in England for the most part, but for people living here off a local wage life is very hard and a daily struggle. I have no idea how large families cope. Groceries aren’t the only things that are more expensive in Turkey. I looked online and compared typical internet broadband prices, in the UK the average price worked out at £230 a year. Here in Turkey we pay around 90tl per month, or 1080tl (£308) per year. Again, that shows that the price of the internet luxury here is more expensive than the UK, without even considering wage differences. I tried to compare electricity prices, but there are such vast differences in the amount that people pay each month it would be impossible to do a comparison, our electric bills every month are between 30-50tl, while I know others who pay 200tl a month, and I have no idea of the breakdown in prices either here or in the UK. Petrol prices here in Turkey are far more expensive than the UK before even considering the wage difference. Car prices here are also ridiculous, a car that you would pay £1000 for in the UK is likely to sell for the equivalent of £5000 or more here in Turkey – no wonder I see so many ancient, non road-worthy cars around, nobody can afford models less than 20 years old. White goods, fridges, washing machines etc and other general household goods here in Turkey are around the same price as in the UK – again when you consider wages are a lot less here, this makes them a lot more expensive in comparison. Another significant thing here to remember is there is no free healthcare. For local people working their bosses should pay for their health insurance which enables cheaper treatment, and for those not working, the amount they pay for health insurance is means tested, but it’s not free. There are also very little income benefits. In order to be entitled they have to have worked and paid insurance for a certain amount of days in a period of time, Berkay was entitled to it last winter and got 300tl per month, who could ever live off that? There are things that are cheaper here in Turkey, for example, council tax, road tax, insurance etc, but when everything else is considered, this is so small and insignificant. Rent prices are a different story. Rent prices are undoubtedly a lot cheaper here in Turkey. From searching online, I found the price of a one bedroom flat in England varied considerably – from £400 in Northern areas, to over £700 in London. In comparison, prices for a one bedroom basic apartment here in Fethiye vary from 300 – 650tl (£85 – £170) – I can’t deny that they are much cheaper here. You may be thinking to yourself, ‘why dont they work harder to earn more’ – it doesn’t work like that. I can only comment for people working in Tourism, as that is all I have knowledge of, but generally people working in this sector will be stuck in it for life. It doesn’t mean they’re lazy or unqualified (Berkay has a diploma in hotel management!) it just means they have no choice. It’s not like they can take on a second job to bump up their wages either – working days here are long with people working up to 12-15 hours a day, 7 days a week. There is no time for another job. All of the above isn’t even considering the fact that a lot of people in tourism don’t have work during winter, and those that do are more than likely working for less than minimum wage as their employer knows they are desperate and will work for any money they offer – some take total advantage and do not even pay them at the end of the month, they simply refuse, and because they have been working without insurance and for less than minimum wage they have no option but to accept it. Im not suggesting the whole of Turkey is poor, there are of course people with very good jobs earning tens of thousands lira a year and people who would be rich even by English standards. But that doesn’t change the fact that for Turkish people, living here in Turkey IS more expensive than living in the UK. I know there will be people who disagree, but if you do the research you might be surprised at what you find. Let me know if you agree, or disagree, I’m open to all comments. I’m really curious at people’s opinions of the cost of living here in Turkey. Before I moved here I had no idea, I didn’t care, I was ignorant, but it’s something that really fascinates me now and I can’t help but get into discussions about it when I see people saying the infamous words ‘it’s cheaper to live over there’. Of course there are many positive things about living here, perhaps the quality of life here outweighs the increased cost of living? Let me know what you think. Thanks for reading, If you got this far, well done, what an essay this turned out to be! Great.post ‘I guess the main gustion how much income aperson needs to live comfortably in turkey? I have to agree. At first when I first started to come to turkey I thought it was so cheap and then gradually realised it getting more n more. Ok to people coming on holiday it probably is cheap because they only coming for a few weeks. For the first time the beginning of October I came out to see my boyfriend for 12 days am paying for both of us I deffinatly realised how expensive day to day things are and when I sit down and talk to my boyfriend about things I can certainly understand where he is coming from now. Someone commented we dont pay Council tax ..we have Ev Vergi which is he same The car Visa (MOT)costs more here and we have to have Depram ( Earthquake insurence ) all theses things holiday makers dont know about… I came here 15 years ago which was the best time i think ,,no one even bothered to tax and insure cars …….it sure has changed ..
I’ve just come across your blog a couple of hours ago and been reading since. I’m from Istanbul. I’m a Turk. At this point you might ask why i am reading your blog as i’m a Turk and your blog consists of the way we (I’m including you into this “we” as well :)) live. But this blog showed me how some stuff, that are little and unimportant to us, can be completely unusual to someone from another country. I would like to add an info here, the rent prices. Here in İstanbul it’s a whole another story. It’s way more expensive than it is in smaller cities. You said renting prices varied between 300 – 650tl, here it is between 650-1500+. And those 650 lira houses are either really far away from the city centre or you wouldn’t wanna live within them. I don’t usually read blogs, but will definitely read this. Hi Akifcann, I’m glad you enjoyed reading my blog! Its exciting to know Turks are reading my blog and enjoying it, hopefully I show a bit of the real Turkey, although I have a lot more to discover! Ohh I had heard that Istanbul is very expensive to live, are the wages higher too? I completely agree with everything stated. Other than the cost of rental, fresh fruit and veg (but not all, some things are much more expensive) and some services, everything else is very pricey. I am suffering from a health condition and have to be careful about my diet. I am totally disappointed in the lack of organic options, and everything labeled organic is crazy expensive and very bad quality. Turks are notorious for the use of pesticides. My inlaws are the first to overuse them. Meat is too expensive for more than once a week. The cars are so expensive and my life quality is so much lower because I don;t have one here. I earn much more than the Turkish minimum, but there is no way I can afford it. Childcare is really pricey, too. Also, they don;t care much about the quality of food they feed to kids and don;t care to take them outside much. If I didnt have my husband here, there is no way I would want to live here. hi yes i totally agree my husband works 17 hours a day 7 days a week not in tourism we are not young he is 50 we have two children we rent our house not own and there is no way we could live on just his wage our rent electric and water before food and anything else we may need takes up most of his wages we are better off than some as i have a pension but if i didnt there is no way we could live here saying that we prob couldnt live in uk either now as i wouldnt make the money to get him over there so we would be living in two different countries with just holiday visits dont get me wrong i love Turkey but it is a struggle every one thinks we are on a permenant holiday here but that is not true we very rarely go to eat out and its not just food its clothes for the kids and toys yes you can get from the market however toys from the market are like what we would get in poundland if you want anything that is going to last you pay alot of money for them espeacially the named brands of toys its no wonder Turkish children have so little what are their parents supposed to do feed them or buy them toys its not easy here but we choose to live if i could would i go back for the children yes i think i would. What a mammoth task you had doing this blog !! I agree with you my friend lived in Turkey for three years and I am aware of the problems. The grass always looks greener but each country has its pitfalls. I’m a Turk who lives abroad and I know why prices went up so much. Population keeps increasing while production increase on goods and food can’t keep up with increased demand. Low income Europeans living in Turkey increase the demand for basic goods and food even more. While this helps people who own businesses, it makes things worse for wage earners because there are more people for the same amount of goods and food hence the price increase. It always comes down to supply and demand. Don’t feel sorry though for them because they deserve this by breeding like effin rabbits as if they can afford it. If a person is dumb enough to not see he/she can’t afford to have children then let them eat cake. Mum 2boys and 2girls…how much would they need approximately for rent food electricity etc..:”.basic” live Stannard if you can call that. olm siz ne ayaksınız lan? I’m planning to travel to Turkey for a six month contract work in a Mobile Company. I will be travelling alone. Please let me know how much I have to spend in terms of accommodation (furnished one bed or 2 bed), transports, internet etc . Hi there. I’m hoping to move to turkey in 6 years time on a pension of about £1000 per month and as a single male. I would like to live in the alanya region and I believe this would allow me a comfortable lifestyle. What are your thoughts on this and any advice for me on what I should start doing in preperation if anything yet. I agree almost entirely with your views which are very accurate however one of the most obvious things which you have failed to mention is that houses cost hundreds of thousands of pounds in the UK whilst in Turkey you can buy a decent house for £20k!!! Thats a lot of day to day bills. Cars and petrol are expensive there however my electric bill in the UK is x20 of that in Turkey. Also I have no oil or gas bills! And most importantly you cant put a price on the feeling of sun on your back all year instead of rain… priceless!